Fantastic shot of the Holy Family Parish neighborhood today from the St Ignatius College Prep website. On Saturday. November 14th, the Ramonat Scholars had the opportunity to see firsthand the neighborhood of the Holy Family parish that we’ve been studying for the better part of the semester. Historian Ellen Skerrett, author of Born in Chicago: A History of Chicago’s Jesuit University and many other books on Chicago Catholic history, was our able guide. We began at Holy Family Church, erected by Arnold Damen and the other members of the Jesuit Order three years after they founded the parish in 1857. Fr. 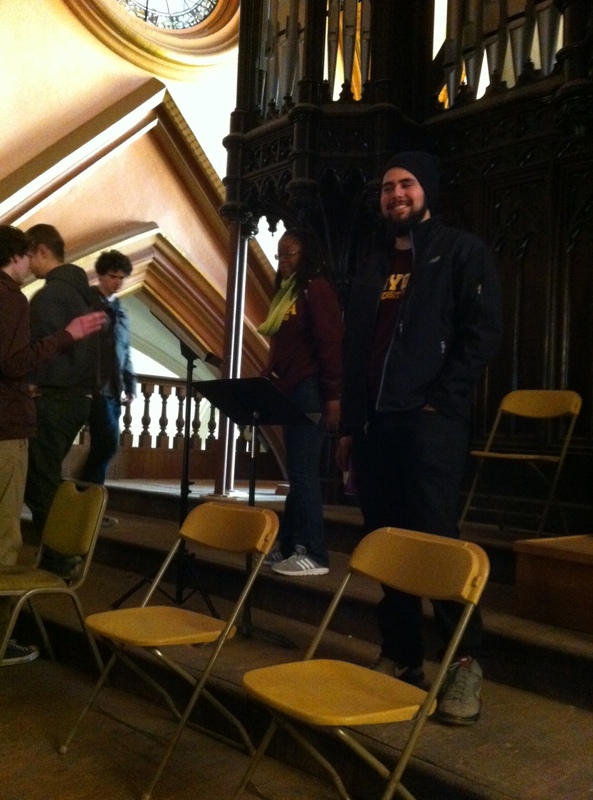 Michael Gabriel graciously greeted us and allowed us to explore the sanctuary and the organ loft. Forty-five minutes quickly flew by as we looked at the bountiful stained glass, sculptures, and paintings, and heard stories about parishioners. We didn’t have to walk far to get to our next stop: St Ignatius College Prep. John Chandler, Vice President, gave us a nearly hour-long tour of the structure built originally as St Ignatius College (1870). From the Brunswick Room, site of one of Chicago’s first natural history museums, to Arnold Damen’s office, to the Prep’s exemplary collection of architectural fragments from the city, we were continually reminded how much history resides in the structure. 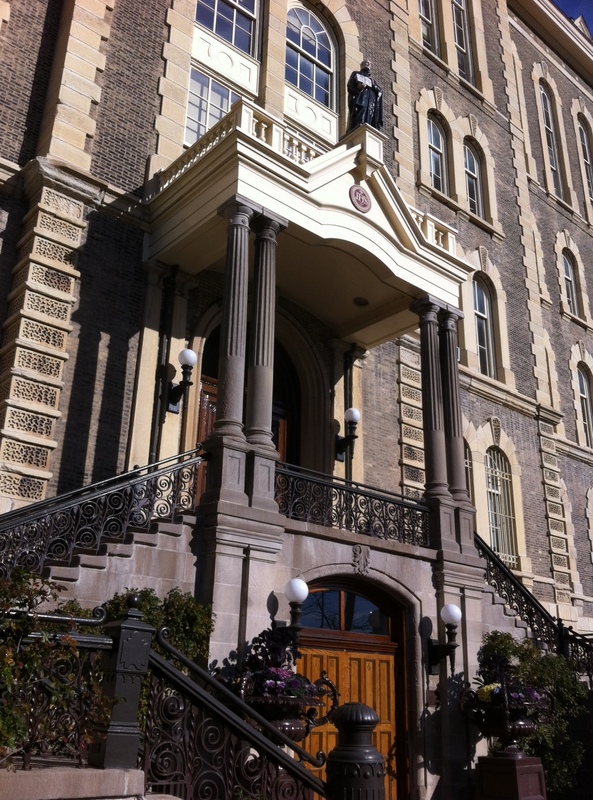 The imposing front entry of St Ignatius College Prep today. Much of the surrounding neighborhood has changed dramatically since the time of the founding of St. Ignatius. The relocation of the University of Illinois at Chicago (UIC) there in the 1960s was perhaps the single most important catalyst. Hull-House is not open for tours on Saturdays, but Lauren Rhodes, Associate Director, was kind enough to come out for several minutes to talk about Jane Addams and her legacy in the neighborhood. Ellen Skerrett is currently the Chicago-based researcher for volume 3 of The Selected Papers of Jane Addams, 1889-1900, so she also had much to share about the relationship of Addams and the other Hull-House staff with local residents. Along the way we stopped by the city’s pre-eminent Irish congregation, Old St Patrick’s. We were shooed out quickly by people getting ready for a wedding, but not before we had a chance to observe the very different decoration scheme in there compared to Holy Family. Finally, we made out way to the site of the 1886 Haymarket Massacre to look at Mary Brogger’s 2004 Haymarket Memorial. We thought about the different ways the past is commemorated in Chicago, contrasting the loving preservation of Holy Family and St Ignatius and the marginalization of the site of the Haymarket massacre. By this point our stomachs were grumbling, so we retired to the Haymarket Pub and Brewery around the corner for some brunch and to reflect on all we had just seen. An image of the Haymarket Memorial from City of Chicago’s website. And Susie questions under what conditions do the religious create things– a church building, a national saint, a painting – to express themselves.